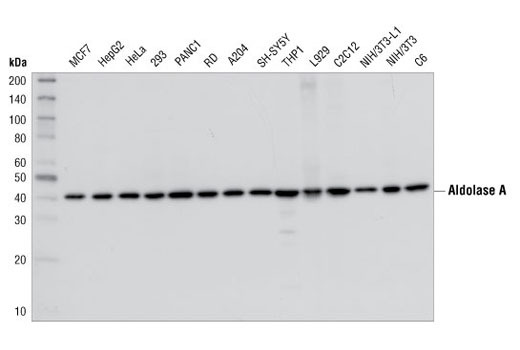 Western blot analysis of extracts from various cell lines, using Aldolase A Antibody. Aldolase A Antibody detects endogenous levels of total fructose bisphosphate aldolase A protein. This antibody may detect total fructose bisphosphate aldolase B and fructose bisphosphate aldolase C proteins. fructose bisphosphate aldolase A protein. Antibodies are purified by protein A and peptide affinity chromatography.